Made from a healthy mix of nuts, seeds, and sweeteners. We finally broke the seal this month and filled up our Chevy Volt with gas. We have been driving it on electricity and the original tank of gas that came with the car since leasing it four months ago. Then came a long business trip to Cleveland (Baptiste yoga training) and we finally had to fill-up. Until then, we had driven 3,254 miles since leasing the car and only used a quarter tank of gas. Since the gas tank holds 9.3 gallons, this means we were getting about 1,400 miles to the gallon for the 2.3 gallons we used. With this milestone, I thought this might be a good time to document our experience with the Volt and answer some frequent questions we get. How far can you go on a single charge? We are probably the perfect consumers for the Volt. We leased it to be used primarily for business purposes for our yoga studio, Move Your Hyde Power Yoga. Our home is 8 miles away from our yoga studio, or 16 miles round-trip. The onboard computer indicates a range of 42 miles on a fully charged battery, which is plenty for the round trip to the studio. Often, my wife makes multiple trips to the studio during the day. As soon as the car hits our garage, it gets plugged in to re-charge. The full charge at night and the partial charges during the day are enough so that rarely is any gas used commuting to the studio. It takes approximately 10 hours using the standard 120V outlet in our garage. If you upgrade to a 240V outlet, this time should be reduced to about 4 hours. The Volt comes with its own power cable. You just plug one end in the electrical outlet and the other end into the Volt’s charging port. According to the Kill A Watt, the Volt used 14.41 kWh during its last full charge. Our electric bill shows that we are charged $0.0763 per kWh for the supply and distribution of our electricity. From this, we see that it costs us $1.10 (14.41kWh x $0.0763) to fully charge the Volt. Considering we also give it partial charges during the day, the $1.50 average per day estimated by GM is completely reasonable. To put our $1.10 cost per charge into perspective, let’s compare it to a $4 gallon of gasoline. $4 in gas will get you around 20 to 40 miles for most cars on the market today. $4 of electricity however, gets us approximately 153 miles of driving distance, assuming a range of 42 miles per charge. Aren’t you still burning fossil fuels to get your electricity? One point often brought up with electric cars is that you are just trading one carbon footprint for another. Even if you are not burning gas, the power plant creating the electricity is burning coal for example. We worked around this issue with our Volt. At the same time we purchased our Volt, we switched our electric supplier to Cincinnati Bell Energy (CBE). CBE is a green energy provider. In our case, CBE contracts with local wind farms that are plugged into our regional power grid. The concept of compensating wind farms for the electricity used to charge the Volt is interesting. The wind farms are supplying electricity, i.e. electrons, into our local power grid whenever the wind blows, which may or may not be the same time we need those electrons to charge our Volt. So how can we charge the Volt using wind power? The key is that electrons, like money, are fungible. If I lend you $5, I don’t care if you pay me back with the same $5 bill, a different $5 bill, or five singles. It’s all the same. Likewise, when I draw electrons out of the grid and pay a wind farm to put electrons in the grid, there is no way for me to know if that electron was generated by the wind farm or not – but it doesn’t matter. They are all the same and I sleep well knowing I paid a wind farm to generate the same number of electrons I used to charge my Volt. As an added benefit, by buying my electricity from a wind farm, I’m investing locally in jobs that can not be exported. (Wind farms must be close to where the electricity is used or else it costs too much to transmit it.) In looking at the $1.10 cost to charge our Volt, $0.78 goes to CBE for the wind farms and $0.32 is our utility company’s charge to distribute that electricity to us. How does the Volt compare to a Toyota Prius? We actually leased a Toyota Prius IV for three years prior to the Volt lease. The Prius was definitely a good car. We drove the Prius for over 50,000 miles and averaged 45 miles to the gallon over the term of the lease. Here’s how the two cars compare. The Prius has more room in the front and back seat. I’m a a pretty big guy at 6-feet, 230 pounds – and with a long torso and broad shoulders. Sitting down I look like I should be 6-foot-4-inches tall – but then I get shorter when I stand up! At any rate I think if I had longer legs and could move the seat back farther I would get more head room, but so it goes. I always struggle to find a car where the top of my head doesn’t brush against the roof of the car. For my rather unique situation, in the Prius, I can sit comfortably in the front and back seat. In fact, I’d say the back seat of the Prius has more room than the front seat of the Volt. With the Volt, I have to lower the front seat all the way down and adjust the seat back to find a comfortable driving position that works. You can forget about sitting in the back seat of the Volt if you’re a big guy. The Prius on the other hand is much more open and less sporty. The console is less cluttered and actually easier to use. The Prius has dedicated buttons for the radio and a simpler climate control. The Volt is much sportier to drive and is whisper quiet while running of electricity. It even has a special second horn that chirps when activated so that you can warn pedestrians in a polite way that you are coming. A number of times we’ve startled pedestrians strolling across parking lots, not realizing a Volt was creeping behind them looking for a parking spot. The Prius has a more iconic look to it and drives fine. I’ve never had an issue getting it up to speed on the highway, though I am a little more selective on when I pass slower moving cars on two-lane roads. They are both good cars; however, we chose the Volt over the Prius because of its ability to plug-in and go the distance. The sportiness and futuristic design make the car very fun to drive and driving over 3,000 miles without filling up with gas was EXTREMELY satisfying. 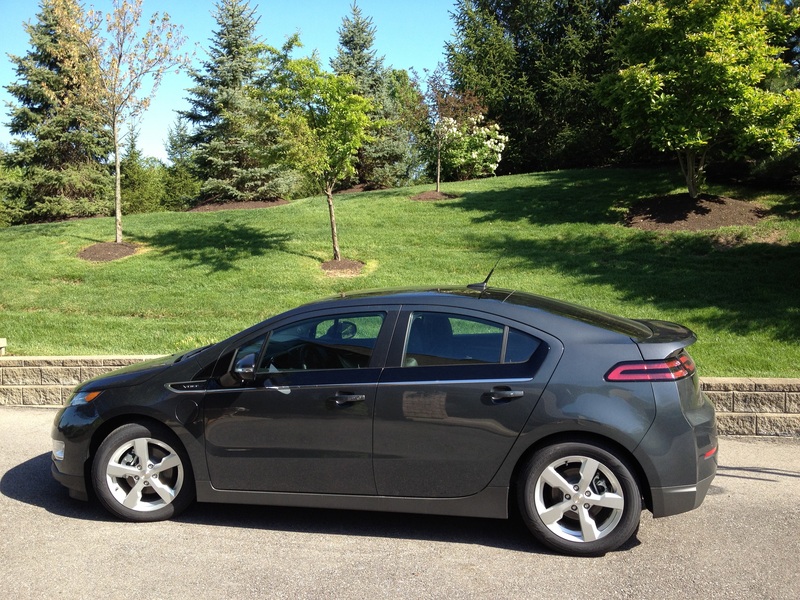 Did you get a tax credit when you leased your Volt? Even though we leased the car, the Federal Tax Credit was still applicable, and was applied to reduce our lease payment. The way a lease works is that you negotiate a purchase price for the vehicle and then finance the difference between the vehicle and the residual value of vehicle at lease end. The residual value is the amount you can buy the car for after all your lease payments are made. If you don’t want to buy the car, you just turn it in and walk away. The way the Federal Tax Credit is applied to reduce your lease payment is a little backwards. Instead of being subtracted from the purchase price, it is added to the residual value. Either way, the amount you finance is reduced by the credit amount, which for us was a whopping $7,500. The downside is that by adding the credit to the residual, the amount to purchase the car at the end of the lease is now $7,500 more than what the car will be worth then. This guarantees we will return the car at the end of the lease, though it’s possible we could turn it in then simply negotiate with the dealer to purchase the car at its market value. Ideally, you would want the Federal Tax Credit to be subtracted from the purchase price instead of added to preserve your options at lease-end. I’m not sure if this is negotiable though. How do you like your Volt? We LOVE it. We’ve leased many different types of cars (economical, sporty, and luxury), and this car is by far our favorite. It’s fun to drive, it’s good for the environment, and it economical. This is the future. If you found this post useful, how about picking up a bag of our Power Granola to say thanks? It tastes great mixed with yogurt or as a cereal and it’s a good source of calories. Seriously, you need calories and you might as well get them from something as nutritious as our granola. You can get more info about our granola on our home page. Question or comments? Please email us at granola@moveyourhyde.com. This entry was posted in Going Green and tagged hybrid car, prius, volt, volt mileage, volt review by PowerGranola.com. Bookmark the permalink. Enter your email address to subscribe to our power granola blog and receive notifications of new posts. Just like our power granola, our blog is a healthy mix of things that are good for you.